Howling loudly into the night, the wolves gather in search for their next prey. Timberwolf is a 5 reel, 1024 way to win slot released by Aristocrat, designed from the grounds up at making you feel like you’re spinning away in Vegas no matter where you are in the world. Go with the classic version, or indulge in Timberwolf Slot Deluxe that has been slightly changed up for player convenience, and experience Wilds, Free spins and multipliers as you traverse the forest. But be careful, or the wolves will carry you off to never be found again! Unfortunately, Timberwolf is still not available online, but you can enjoy other Aristocrat Reel Power slots, such as Buffalo Stampede (free play), Choy Sun Doa, Pompeii and others. Depending on which version you’re playing, the graphics are either retro and laid back, or upgraded for more modern times. In both, the basics remain the same – the symbols are a mixture of gambling icons and animals found in the woods, but the Deluxe version brings the appearance of those symbols and of the reel to look a bit less outdated than today, as well as some minor gameplay tweaks. The 5×4 playing field makes for compact but interesting gameplay. 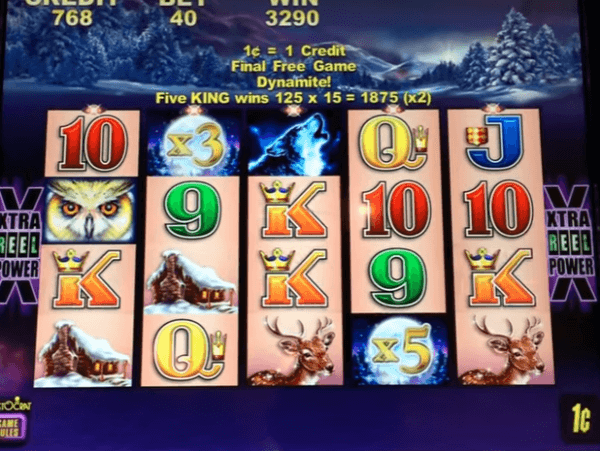 The large number of paylines helps keep things interesting, and as Timberwolf slot machine is playable for as little as $0.40, or $0.50 if you play the upgraded version, it should have an appeal that can go for both casual players and high rollers alike. Wilds are very important in Timberwolf. Aristocrat’s release allows the Moon symbol to appear on the second and fourth reel, being able to replace any symbol in the game – including Scatters. This means Wilds can potentially be used to complete the extra round special feature, making them quite a treat to see! Remember what we said about slight gameplay changes between the two versions? That’s visible in the free spins bonus offered by the Owl Scatters. Classic gives you 12 free spins to start with, and attaches a multiplier to the Wild, increasing any wins by 3x or 5x. What’s more, if the Wild is part of a win, it is locked onto the reel and gives you a respin. The deluxe version adjusts things slightly, adding a layer of strategy without taking anything away. 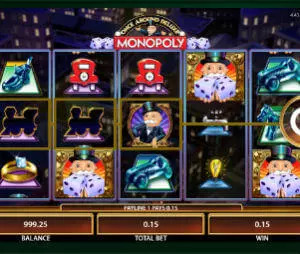 The slot now offers you a choice between the number of free spins and the strength of Wild multipliers. You can choose between 6 to 21 bonus games, with increasing or decreasing multipliers depending on how many spins you choose. While sequels or remakes can be hard to get down properly, we feel Timberwolf manages to appease both sides with their handling of the new release. Allowing you to play both the classic version to revisit nostalgia and giving you the option of playing the remastered Deluxe version to see what they changed is quite nice. The game feels the same, not losing the original charm, while the small changes they did make smooth out the entire experience and make it wonderful. If you have some coins to spare, we’d certainly recommend trying it out.